Why? Because he is fictional. If you are afraid of wrathful, you should be running away from Jesus as much as from anyone you meet in the Old Testament. Of course, even that comparison is fraught with falsehoods. To begin with, the Old Testament is not about “the Father” who gets supplemented by his much nicer Son in the New Testament. Quite the contrary, it was Jesus who met Moses on Mount Sinai. The New Testament is new more because it reveals the Father. Jesus declaring himself the Son doesn’t mean he’s a new character being introduced now. It means we learn more clearly that someone had sent Him from the beginning. He introduces His Father. All divisions of history that go from an age of the Father to an age of the Son are clearly backwards. Questions Science Will Never Solve? Blogger George Dvorsky for Altering Perspectives has written a piece titled, 8 Great Philosophical Questions That We’ll Never Solve. Dvorsky’s premise is that philosophy goes where “hard science” cannot, therefore some of the most fundamental questions of our existence cannot be answered with absolute certainty. The eight questions listed in the article are: Why is there something rather than nothing? Is our universe real? Do we have free will? Does God exist? Is there life after death? Can you really experience anything objectively? What is the best moral system? And What are numbers? 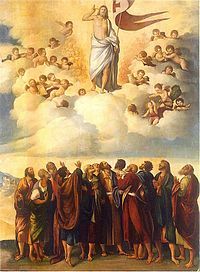 The Church celebrates the Ascension of our Lord this Thursday. Since many Protestant churches find it difficult to gather parishioners for a Thursday service, many of them celebrate Ascension on Sunday. The Ascension of Jesus is barely mentioned in the evangelical vocabulary. We make room for his birth, death, and resurrection, but we tend to put a period where God puts a comma. If the resurrection was the beginning of Jesus’ enthronement, then the ascension is the establishment of his enthronement. The Ascension activates Christ’s victory in history. The Great Commission is only relevant because of the Ascension. Without the Ascension the call to baptize and disciple would be meaningless. It is on the basis of Jesus’ enthronement at the right-hand of the Father, that we image-bearers can de-throne rulers through the power and authority of our Great Ruler, Jesus Christ. But this joy is given to us by a bodily Lord. We know that Jesus is at the right hand of the Father. He is ruling and reigning from his heavenly throne. He has given the Father the kingdom, and now he is preserving, progressing, and perfecting his kingdom. He is bringing all things under subjection. Jesus has gone before us in a way we may follow through the Holy Spirit whom he has sent, because the way is in his flesh, in his humanity. As we consider and celebrate the Ascension of our blessed Lord, remember that you are worshiping the One who understands your needs, because he has a body just like you; he understands your joy because he has a body just like you. Uri Brito is a pastor and blogger. He treasures earthly life, but dwells in the heavenly places. Or which one of you, if his son asks him for bread, will give him a stone? Or if he asks for a fish, will give him a serpent? If you then, who are evil, know how to give good gifts to your children, how much more will your Father who is in heaven give good things to those who ask him! We all know this Scripture (Matthew 7.9-11). It is part of a famous passage exhorting hearers to trust God and pray to him. What I find interesting about it is that it doesn’t come up more often in questions about human depravity and human virtue. I wish I knew what Abraham Kuyper said about these verses, since he wrote a great deal about “common grace.” As it stands now, what I mainly have is an extensive reading in virtually everything Cornelius Van Til ever wrote. Van Til was a famous Kuyperian, but my reading took place many years ago. If you have been following the progress of this humble bunch you know that we enjoy life; more importantly, we enjoy the good life. We treasure angels, we despise angel-killers, we favor truth, and have an intense allergy for falsehood and hypocrisy. Above all, we like a good party! Part of this party-spirit stems from the inspiration to carry on our noble tasks as ambassadors of the Most High God. When we say we believe in God the Father Almighty, we are doing more than creedal recitation, we are challenging the world to a duel. This is why we are Christians. We refuse to give ground to unbelieving thought. Neutrality is one of those words we dare not utter unless we negate it. Our purpose is to echo Kuyper’s words “Not Once Square Inch,” into every word and argument we make in this endeavor. I realize it’s a noble and difficult task to live so consistently with such a robust vision, but it’s what we aim for around here. In this 700th post, we celebrate also over 50,000 hits. This may not seem much, but at the very least it says that our labors are not in vain, and that there is a legitimate need to discuss the issues we are discussing in this virtual lecture hall. So as we aim toward the next 50,000 hits, let me encourage you to spread the word! Share our posts on Facebook and Twitter. Leave comments and feedback on how we can better improve your reading experience. We really do believe what we say is worth listening to. And so on behalf of the 16 writers of Kuyperian Commentary, I would like to say thanks for your support and continual encouragement! Party on! What Does Jesus Look Like? The History Channel’s hit miniseries “The Bible” offers us yet another on-screen depiction of our Lord and Savior, Jesus Christ. The honor this time goes to Diogo Morgado, whom the New York Post calls “a kind of surfer Jesus.” The Portuguese actor’s Jesus is not exactly Anglo (although his on-screen accent is); but basically, this Jesus is white. And therein lies a problem. My thoughts on what Jesus looks like were spurred by a fascinating lecture at Baylor by the University of Colorado’s Paul Harvey, author with Edward Blum of The Color of Christ: The Son of God and the Saga of Race in America. In spite of the Ten Commandment’s ban on “graven images” (and the worship of them), many Christians have become so used to visual representations of Christ that we often don’t give them a second thought, nor consider what they say about our mental picture of the Son of God. The medieval church also produced artistic representations of Christ, but many Protestants assailed these icons, tapestries, and paintings as violations of the second commandment, smashing and burning many of them as they had opportunity. The Puritans and some other early settlers of America tried not to employ visual representations of God, although they surely must have had some mental image of God or Jesus as they spoke to him in prayer. During the nineteenth century, visual images of Jesus became more common among American Protestants, and they were almost always ‘white’ – or at least not distinctly Semitic/Middle Eastern/North African, which one would think would be the preferred choice if ethnic accuracy were a priority. These images became more common – and insistent – in the years following the Civil War. Perhaps the most disturbing use of the white Jesus was in D.W. Griffith’s Birth of a Nation (1915), in which Jesus blessed the founding of the Ku Klux Klan. Most depictions of a white Jesus were more innocuous in intent than Birth of a Nation, and the most common one in American homes was Warner Sallman’s 1941 The Head of Christ. The commonplace depiction of Jesus as white led to indignant reactions, with some African Americans and other Christians claiming a “black Jesus” or some other Christ of their own ethnicity. I don’t mean to go all ‘Puritan’ here, but should churches promote any visual depictions of Christ? Do the images of a white Jesus risk making God in our own image? Would a more Semitic Christ solve the problem? Or should we return to the full Reformed skepticism about using any images of God at all? Whatever our answers, the fact remains that Christians do normally imagine Christ’s appearance as we read the Bible and pray (reported visions of Jesus have often seemed Anglo, too). Scripture, however, gives us precious little guidance about his appearance. If not the Jesus of Warner Sallman or The History Channel, then what should he look like? Thomas Kidd is contributing scholar to The Kuyperian Commentary. His newest book is Patrick Henry: First Among Patriots, published in 2011 with Basic Books. This article was originally published at Patheos. Bill O’Reilly had on Pastor Robert Jeffress of The First Baptist Church of Dallas, TX. Jeffress gained a lot of attention during the 2012 presidential elections when he opposed Romney—in favor of Perry—on the grounds that Romney was a Mormon. Jeffress argued that we needed an evangelical in the White House.